Kid friendliness: no high chairs available. If you've wandered around enough Taipei food courts, you've probably spotted an "omu-rice" dish or two- looking like an oversized omelette drizzled with ketchup and stuffed with ketchup flavored rice. But have you ever tried one? I think before eating at Fu Diner, I've had a bite of one, once or twice, so it was with curiosity that I checked out the menu at Fu Diner, a whole restaurant dedicated to different variations of omu-rice. 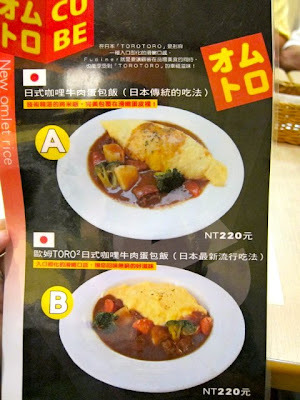 With about a dozen ways to choose from, little international flags mark the flavor profile of the various omu-rices on the English and Chinese menu-- Japan flag for the traditional japanese rice omelette (crisscrossed with ketchup!) or Japanese teriyaki chicken, to the French rice omelette with beef stew or baked with cheese, to the Indian rice omelette with spicy pork curry sauce. 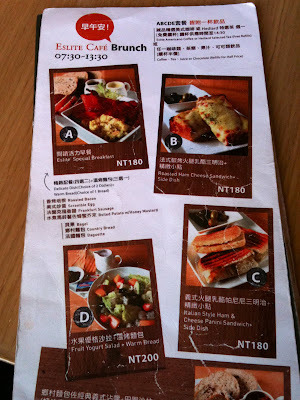 I order a set with my lunch, which is an additional NT$70 for soup, salad and a choice of milk tea/fruit tea/tea. 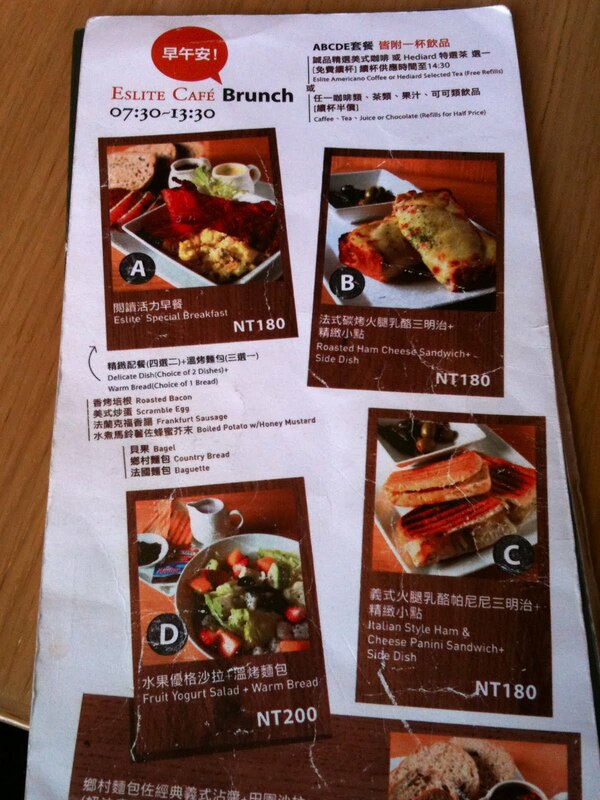 You can also get a set with dessert and tea for NT$70 extra, or add everything for NT$120. The corn soup is creamy and sweet enough, and the salad has more corn on it. My Japanese "teriyaki" chicken rice omelette with mushroom sauce (NT$220) seems more like a mushroom, chicken stew and to my surprise the rice in the omelette is devoid of any red, ketchup coloring or flavor and there's no teriyaki sauce on the chicken. The egg is silky and runny unlike the omelettes I've seen the food courts and mixes together with the rice and the sauce quite well. The omu-rices are made to order and come to the table one to two at a time. I notice with a bigger group at the next table, some people are halfway done with their food before the last of their table's food arrives. Fu Diner is out of their chiffon cake, so we opt for vanilla ice cream and tiramisu which has too much cream and not enough sponge cake to my liking. Longtime readers of my blog might remember a restaurant or review about a restaurant called Moga, which served fusion Italian-Japanese fare. Turns out the owners of Moga reinvented themselves and opened up Fu Diner. The good thing is that they also put their waffle fries on the menu, which makes for a tasty side. If you're not a fan of omu-rice, they also have a few pastas on their menu. My grandma got this vegetable pasta which I didn't try. The decor is cheery and bright and fills up with groups and businessmen after noon- when we sat down at 11:30AM on our second visit, the restaurant was empty, but the 30 or so seats were filled to capacity when we left. I'm not entirely sure what the name of Fu Diner has to do with the food- in mentioning the restaurant to a friend who said "What is it called?" I said, "Fu, like F-U" which of course resulted in laughter. I accidentally ordered the Truffle Genovese instead of my usual Portobello Mushroom when ordering in Chinese (I order a "mo goo" pizza not knowing the Chinese for portobello). But it turns out to be a happy accident. The truffle oil gives the pizza a fragrant earthiness and I easily can eat the whole pie (but I don't!). The crust is still wonderfully chewy and springy, and the pizza while thin is not dry. The deal is pretty good considering their 8 inch is not much cheaper than the 10 inch, so it's a good time to try a new flavor on the house (and their prices have gone up quite a bit since I first discovered them in 2009). The downside is that you gotta leave the restaurant before you can dig in. Maybe sneak a bite in the car if you can't wait until you get home. 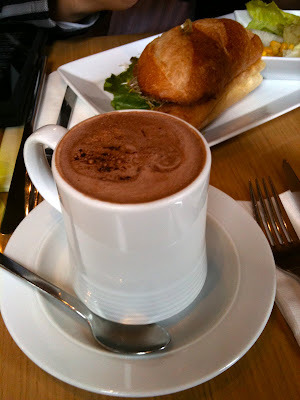 One peaceful place you can grab your coffee and toast is the Eslite Cafe which has a few breakfast options and opens at 7:30AM. Brunch sets are NT$180-200 and is available daily until 1:30PM. You can also order off their regular menu, as my friend did, getting a sandwich that had way too many sprouts for me and a hot chocolate that probably cost as much as my set. Instead, I got set A, which has a deceiving picture on the menu, brimming with food. You're only allotted the choice of 2 of the 4 things (bacon, eggs, sausage or potatoes) and 1 choice of bread (bagel, country bread or baguette). After some convincing, the waitress let me trade my starch choice from bread to potatoes. As you can see it's not really a generous amount, and even worse, the bacon wasn't crispy. More filling sets are probably the croque monsieur or ham and cheese panini. Overall, the taste was not too bad, but it's most likely that they are just reheating whatever was premade since there isn't really a kitchen in that coffee shop space. But on this early morning, it's a nice space to enjoy an early breakfast and then have an excuse to browse the books afterwards. Who eats shaved ice during the winter time? Especially when my sister is in town for a short visit and we gotta hit up all my favorite eats, which definitely includes Tai Yi Milk King. It's also great to go when it's wintertime because then you don't have to duke it out for a seat. To warm up, get a bowl of tang yuan as well, which you can get with either hot red bean, rice wine or sweet peanut soup. The sesame oozing out of the chewy tang yuan is a perfect bite, just in time for the Lantern Festival. Or get some tang yuan to go to make at home and then join the crowds at SYS Memorial Hall to check out the Year of the Rabbit lanterns. 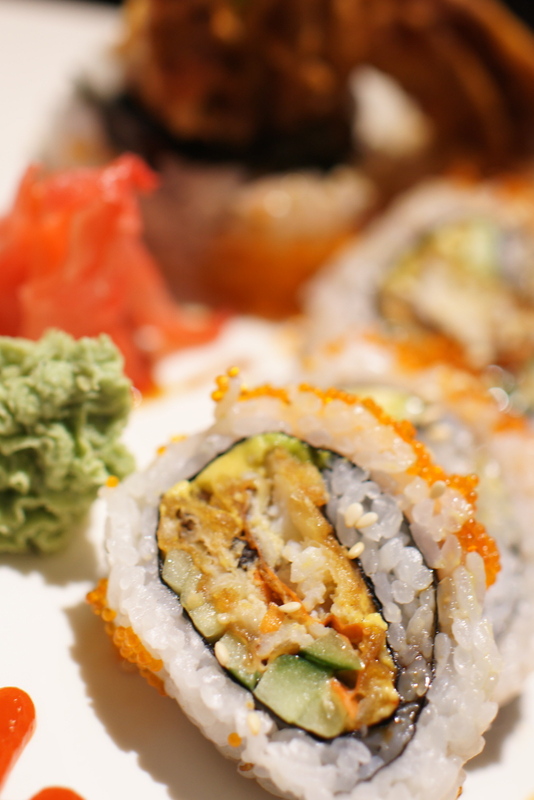 There's plenty of sushi bars in Taipei, but if you're looking for the kind of heaping rolls with drizzled in eel sauce or deep fried, then you have to look a little harder. I've had some miserable and some not so bad and some great, but none like my favorite roll place in LA that has so many crazy combos of huge rolls for great prices. I first heard about Sumi Sushi when my friend M said her friend S said they had the best spider roll. The same week, another friend posted some drool worthy pictures on her Facebook and I couldn't wait to give it a try. It's not too far from the also newly opened Macho Tacos and Toasteria on Lane 248, a little over two blocks away from ZhongXiao, and has a nice bright blue sign in English to spot. 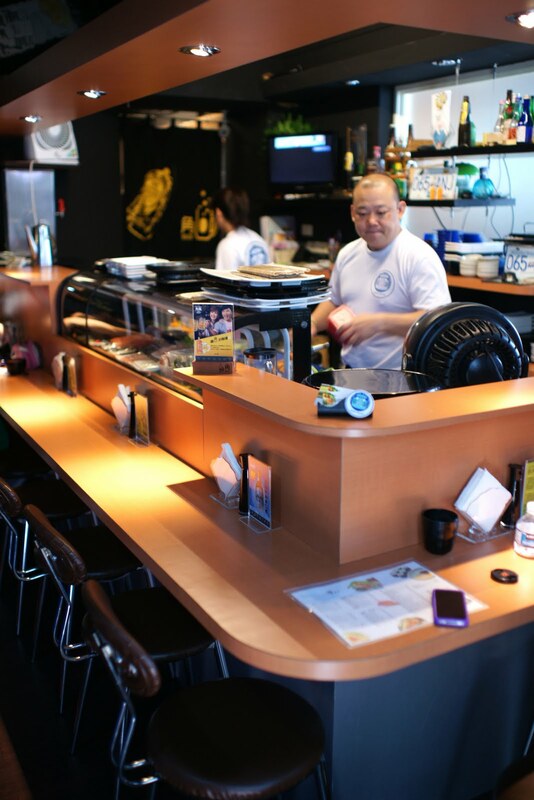 Inside is quite tiny- just a sushi bar with about 14-16 seats, depending on how squished everyone needs to be. I had made a reservation for our group of 5 and after we were eating for about 20-30 minutes the rest of the counter was filled with a reservation of 8 people, so a few walk-in customers were turned away. 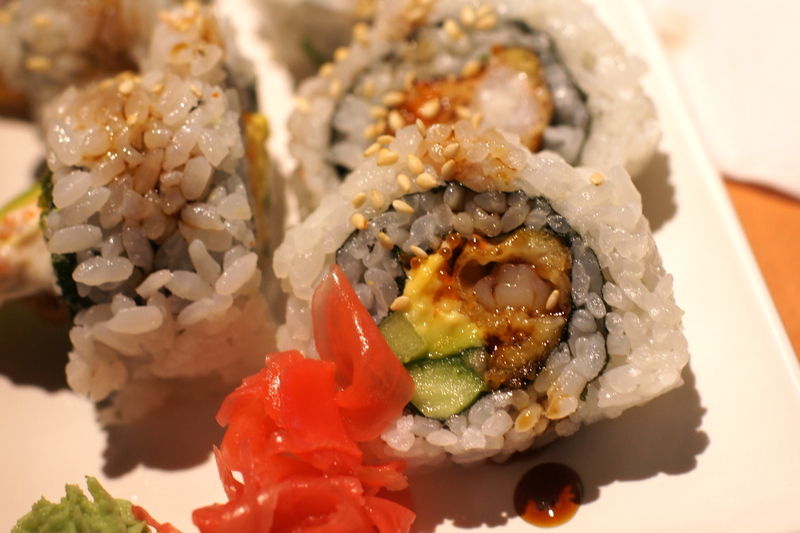 The English and Chinese menu offers a few appetizers and dons (rice bowls with sashimi or eel), as well as nigiri and sashimi, but we are here for the rolls! Sumi Sushi was opened by a Taiwanese couple who had moved back from Canada after living there for around 20 years and missed the rolls that they could find there. So it's great that I could order the rolls in English because I'm not sure if I could figure out all the rolls names in Chinese. While there aren't many pictures of the rolls on the menu, you can check them out along the wall, though they are identified only by their Chinese name. 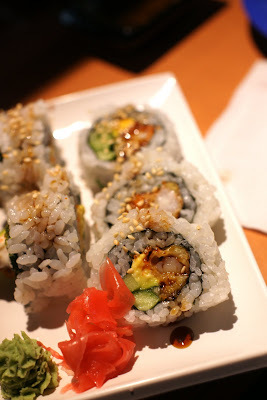 This lead me to quiz the chef about a lot of the rolls (What is a Sumi roll? What is a Volcano roll? What is an Alaska roll?) to which he patiently and cheerfully answered. You can also give him a budget and let him put together a menu for you, and let him know what you like and don't like. It's a good way to sample things, but if you know what you like and don't like, then you might be better off ordering ala carte. and the dynamite roll which has tempura shrimp, avocado and cucumber (NT$130). Dynamite rolls that I'm used to come covered with special sauce and then are baked, but Sumi Sushi's version doesn't, so don't get confused there. 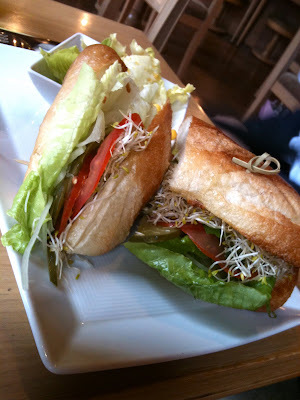 I was bummed that the spicy tuna roll (NT$160) was all spiciness and no sweetness. The best spicy tuna I've found in Taipei so far is either the rolls from A Plus or the appetizers at Dozo. I know it won't matter to some, but I felt that the rolls that were bigger in size were a better value, since most of the rolls were along the same prices. So I wasn't crazy about the bite size Philadelphia(NT$180) featuring salmon and cream cheese, or scallop rolls (NT$200) either. I wanted more mega monster rolls, but instead many of the rolls were more dainty and not filling. I also wanted more eel sauce than the sushi came with, so next time I'll ask for more since the spicy sauces on the side didn't do it for me. The appetizers are worth ordering if you want something other than rolls- the chicken chop (NT$100) had a simple, but nicely grilled flavor and texture. And the grilled ika (NT$80), or squid, was fresh and chewy without being tough. The miso soup(NT$20) and salad(NT$50) came at the end of the meal, and both were on the sweet side. The miso was so sweet that I couldn't finish it, but the dressing for the shredded cabbage echoed the miso, carrot and sesame dressing that I've had at Blue Marlin in LA. 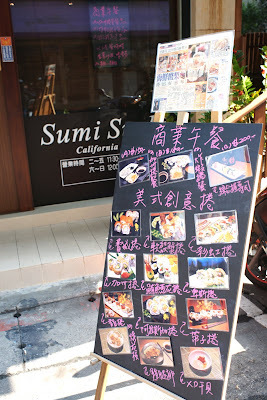 Sumi Sushi should continue to have good word of mouth with its affordable prices and relaxed sushi bar setting. I was wavering between a 'recommend' and a 'strongly recommend' and decided to give them a 'strongly' since I've gotten sushi to-go on more than one occasion since my first visit a few months ago when I'm craving last minute rolls. Too bad they don't deliver- that would be awesome. It's fascinating to me how various pockets of Taipei are becoming "restaurant rows" for international eateries- since every lane and alley is pretty much a restaurant row- but I'm talking about places like Lane 248 that has grilled cheese sandwiches, pizza, sushi rolls and fish tacos in the same area, as well as Lane 280 off of Guangfu which has the new Italian restaurant Osteria by Angie, Ari Korean tofu (both of which reviews are coming! ), the new branch of 15 Pizza and the new branch of Wendel's a block away. Any other "restaurant rows" that I should explore? Giving some lovin' to myself with my favorite red velvet with cream cheese frosting. Not from scratch, but homemade, tasty and sparkly (thanks to my sister who couldn't resist bringing me pink sprinkles from LA). The combination of a little bit of writer's block, lots of relatives & holiday busy-ness, and a big (non-blog) project has made it hard lately to blog as often as last year, but I'm trying to get back to putting words to the screen (and getting the results of the 2010 Best of Taipei Readers' Favorites posted!). 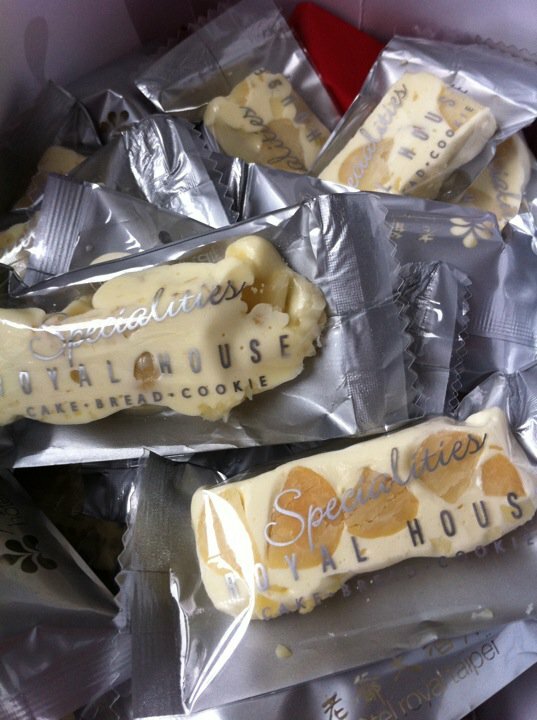 Until then, here's a snapshot of some macadamia nougat candies that I received as a gift (Thanks P!) that I can't stop eating. They are dangerously addictive, chewy and sweet. The first day I received them I might have eaten three of them in one sitting. Ok, maybe more like five. Definitely won't help the new year resolutions. If you've never had a nougat, it's sort of like a caramel or taffy but not as sticky. Think Baby Ruth without the chocolate. And this is the first time I've had them with macadamia nuts which totally compliments the creamy texture with the nutty bite. I usually never buy nougats because I've had some peanut candies that were too sticky or hard, but I'll have to resist buying more of these in the future because if they're in the house, I'll eat them!